I transferred 8ug (136uL) of Crassotrea virginica gDNA (isolated earlier today) to two separate 1.7mL snap cap tubes for sonication/shearing. 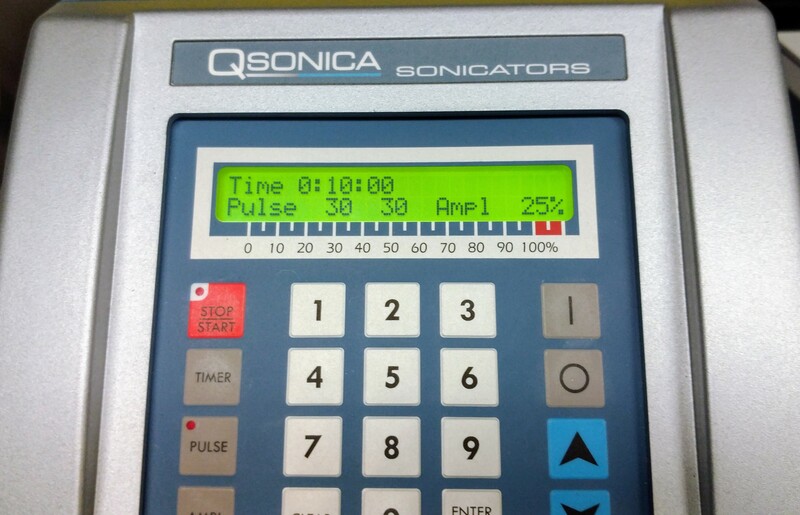 I performed shearing at the NOAA Northwest Fisheries Science Center, using the Qsonica Q800R. Mackenzie Gavery assisted me. Target fragment size was ~500bp. 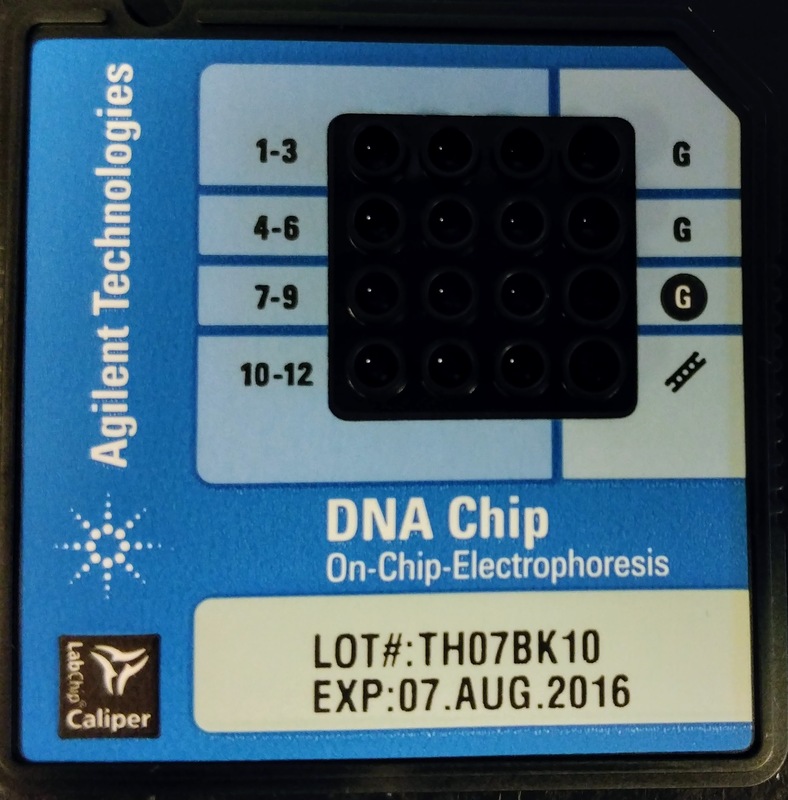 After sonication, fragmentation was assessed using the Seeb Lab’s Bioanlyzer 2100 (Agilent) and the DNA 12000 Chip Kit (Agilent). NOTE: All of the reagents and the chips were past their expiration dates (most in June 2016). Fragmentation was successful, and pretty consistent. Both samples appear to have an average fragment size of ~420bp. Will proceed with MeDIP, once reagents are received. This entry was posted in Miscellaneous and tagged bioanalyzer, Crassostrea virginica, DNA 12000 assay, DNA Shearing, Eastern oyster, qsonica, sonication on 11 December, 2017 by kubu4. Some tubes contained a high quantity of algae, based on quantity of material in tube and overall green color. Samples 1B1 & 1B2 from 20110519 have excessive quantities of algae. Samples 6B1 & 6B1 from 20110519 have a fair amount of algae. Sample tubes after brief spin, prior to DNA isolation. Prior to isolation, samples were briefly spun (12,000g, 15s @ RT). Supernatants were discarded. DNA was isolated using the DNeasy Blood & Tissue Kit (Qiagen). Samples were resuspended in 180uL of Buffer AL and 20uL of Proteinase K. Samples were mixed by vortexing and incubated @ 56C O/N. The manufacturer’s protocol (Purification of Total DNA from Animal Tissues (Spin-Column Protocol)) was followed. Due to low quantities of starting tissue, samples were eluted with 200μL of Buffer EB to maximize DNA recovery. Samples were prepared for quantification via fluorescence using the Quant-iT DNA BR Kit (Life Technologies/Invitrogen). The manufacturer’s protocol was altered to use 5μL of sample and 5μL of standards (instead of 10μL) in each well. All samples/standards were run in duplicate and read on a FLx800 plate reader (BioTek). Mean fluorescence of the standards were plotted with a best-fit line. 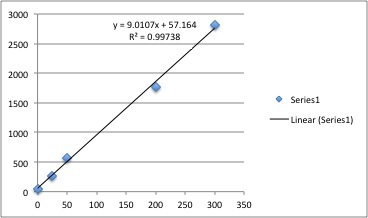 The resulting equation from the best-fit line was used to determine sample concentrations from their mean fluorescence. All samples have yields great enough to proceed with shearing and bisulfite conversion. Samples 1B1 and 1B2 from 20110519 have extremely large yields. This is not surprising, considering the amount of algae present in the source tubes. Will process only 500ng from each sample. Adjusted volume of all samples to 190μL using Buffer EB (Qiagen) in 1.5mL snap-cap tubes. Cycling params were adjusted from the last time I performed this, since I felt the final sheared size was a bit on the small size. After shearing, samples were stored @ 4C until I could SpeedVac them to reduce their volumes, as the bisulfite treatment step requires volumes < 24uL. This entry was posted in Crassostrea gigas larvae OA (2011) bisulfite sequencing and tagged Crassostrea gigas, DNA Isolation, DNA Quantification, DNA Shearing, larvae, OA, ocean acidification on 9 January, 2015 by kubu4. Ran ~250ng of sheared C.virginica gDNA from yesterday’s shearing. The shearing is, surprisingly, very inconsistent across the samples. The target average fragment size was ~350bp. However, most of these samples are <250bp. The MethylMiner Kit (Invitrogen) suggests that an average fragment length of 100 – 200bp is ideal for short-read high-throughput sequencing, but we’re going to perform a bisulfite conversion on these which will result in some additional fragmentation, further reducing the average fragment size. Will proceed with methylated DNA enrichment. This entry was posted in LSU C.virginica Oil Spill MBD BS Sequencing and tagged Crassostrea virginica, DNA Shearing, Eastern oyster, gel, MBD-Seq on 26 November, 2014 by kubu4. Used the remainder of the “sheared” samples (see today’s earlier entry; ~2750ng). Brought the volumes up to 80uL and transferred to 0.5mL snap cap tubes. The volume of 80uL was selected because it’s above the minimum volume required for shearing in 0.5mL tubes (10uL according to the Biorupter 300 manual) and the MethylMiner Kit (Invitrogen) requires the input DNA volume to be <= 80uL. Target average fragment size is ~350bp. See tomorrow (20141126) for the gel. This entry was posted in LSU C.virginica Oil Spill MBD BS Sequencing and tagged Crassostrea virginica, DNA Shearing, Eastern oyster, MBD-Seq on 25 November, 2014 by kubu4. Pooled “low quality” samples and pooled “high quality” samples separately (in 1.5mL snap cap tubes) prior to shearing to improve chances of getting similar DNA size ranges. I neglected to run a set of un-sheared DNA. Both samples appear to have an average size of 200 – 400bp. 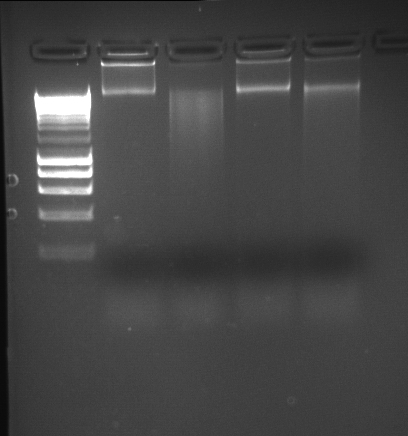 After confirming satisfactory shearing, the two samples were combined and run on a 1% agarose low TAE gel (stained with EtBr) for size selection. 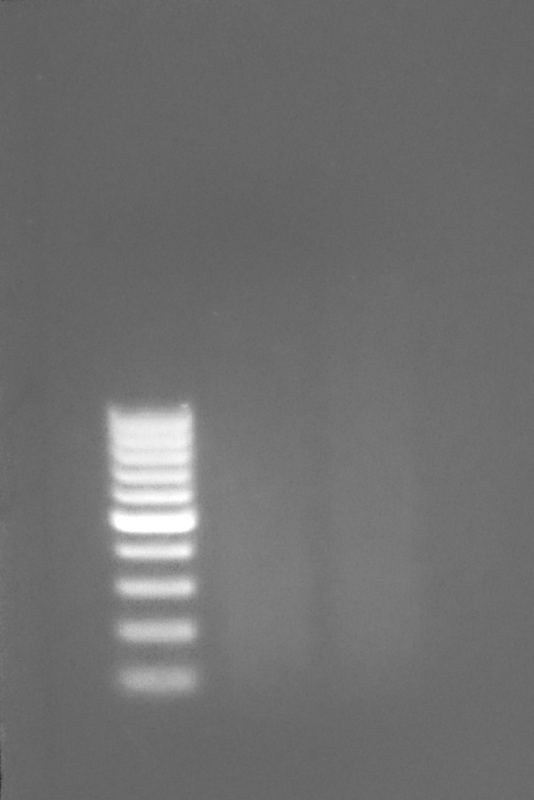 Size range of sheared DNA from 300 – 500bp was excised from gel. Purified using MiniElute Gel Extraction Kit (Qiagen). Added three volumes (762uL) of Buffer QG to gel slice. Incubated ~10mins on rotator until gel slice was fully dissolved. Added one gel slice volume (254uL) of isopropanol; inverted multiple times to mix. Added 700uL to MiniElute column; spun max speed (~16,000g) 1min; discarded flow-through. Added remainder of sample to MiniElute column; spun max speed (~16,000g) 1min; discarded flow-through. Added 500uL of Buffer QG to MiniElute column; spun max speed (~16,000g) 1min; discarded flow-through. Added 750uL of Buffer PE to MiniElute column; incubated @ RT for 5mins; spun max speed (~16,000g) 1min; discarded flow-through. Spun MinElute column spun max speed (~16,000g) 1min; transferred column to clean 2.0mL tube. Added 50uL of Buffer EB to column, incubated @ RT for 5mins and spun max speed (~16,000g) 1min; discarded column. This entry was posted in Olympia oyster reciprocal transplant and tagged DNA Shearing, gel, gel purification, library prep, olympia oyster, Ostrea lurida, RAD-seq, size selection on 6 November, 2014 by kubu4. AFA Intensifier tubes and associated Covaris adapter. 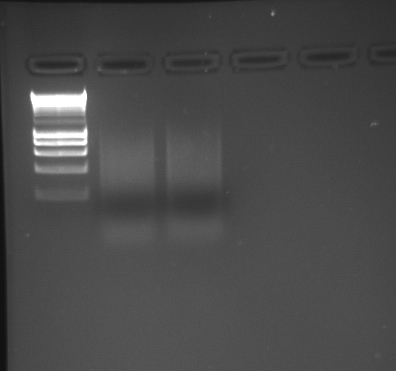 After shearing, ran 250ng of each pool on a 2% TAE agarose gel for fragmentation verification. 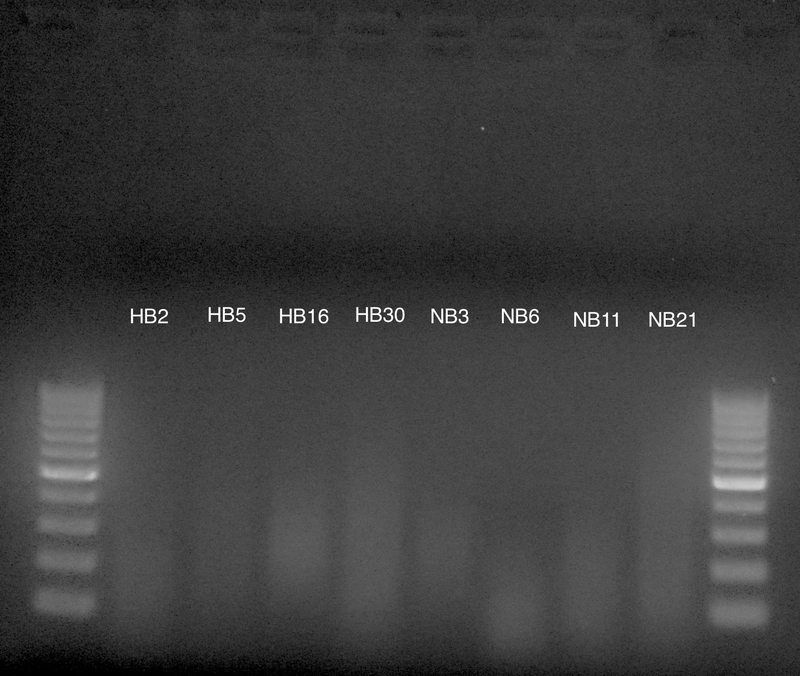 Looking at this gel, the samples have been successfully fragmented and I would estimate have generated and average fragment size of ~400bp (going from bottom to top of the Hyperladder: 200bp, 400bp, 600bp, 800bp, 1000bp). So, this looks great! Can proceed with remainder of MeDIP procedure at any time. Additionally, I will confirm a more accurate assessment of average fragment size by running these two samples on the Agilent Bioanalyzer. This entry was posted in Miscellaneous and tagged Covaris S2, Crassostrea gigas, DNA Shearing, gDNA, gel, Hyperladder I, Pacific oyster on 25 June, 2010 by kubu4. To be noted, the Covaris guidelines list the use of an “AFA Intensifier” tube, which I did not use (because we don’t have them). After shearing, ran 250ng of each pool on a 2% TAE agarose gel for fragmentation verification. Also ran 250ng of pre-sonication DNA from each pool as controls. Am consulting with a person in Genome Sciences who has used a Covaris for DNA fragmentation in the past to see if the AFA Intensifiers are indeed necessary and, if so, we can use two of them. Hopefully have an answer soon and be able to proceed with additional fragmentation next week. This entry was posted in Miscellaneous and tagged Covaris S2, Crassostrea gigas, DNA Shearing, gel, Hyperladder I, MeDIP, Pacific oyster, R37, R51 on 18 June, 2010 by kubu4.